Hnutí Duha, a member of the EUDA Partnership Network, is looking for Austrian or German (Bavarian) partners for a project which will be submitted in the Interreg V-A Programme - Cross Border Cooperation between Austria and Czech Republic (www.at-cz.eu). Hnutí Duha, a member of the EUDA Partnership Network, is looking for Austrian or German (Bavarian) partners for a project which will be submitted in the Interreg V-A Programme – Cross Border Cooperation between Austria and Czech Republic (www.at-cz.eu). Hnutí DUHA (Friends of Eearth Czech Republic) deals with the issue of protection and monitoring of Lynx cats in the border region in the Czech Republic. 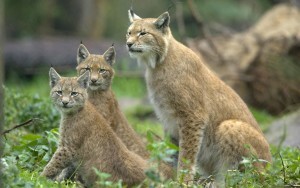 They organise Lynx patrols and provide public awareness campaigns about lynx. Czech-Bavarian-Austrian lynx population is cross-border and thus its protection and monitoring requires international cooperation. That is why we are looking for partners to prepare a project on this topic under the Interreg VA Programme – priority Raising awareness and educational activities in the field of nature and landscape protection and its use (more information in German here). Below you can see the description of activities which we would like to implement together with an Austrian or German partner, which are meaningful from our point of view and which also fit into the conception supported in frame of the Interreg Programme. It is certainly possible to modify or complete the activities after a joint discussion. If interested for cooperation, please contact Mrs. Stepana Tezka, Manager of the EuDA partnership network at stepana.tezka@eracr.cz. Priority: To raise awareness and to provide educational activities in the field of nature and landscape protection and it’s use. Please contact Štěpána Těžká at stepana.tezka@erarc.cz for further information.